Implementing the Internet of Things (IoT) on campus doesn't have to be a high-budget affair. By focusing on low-cost solutions and quick wins, the College of Staten Island (CSI) has found a number of ways to assist and support students throughout their academic journey. These include open source and inexpensive solutions such as sensing and location-based services used for shuttle service to the ferry, computer lab availability, and system status updates. Here's how IoT is making a difference at CSI. The College of Staten Island is a four-year senior college of the City University of New York situated on 204 acres in the borough of Staten Island. CSI also has a satellite campus at St. George, which is close to the Staten Island Ferry. The approximately 12,300 students attending CSI can experience a rural setting on campus, while at the same time enjoy the many privileges of being close to Manhattan (a 30-minute ferry ride) and other New York City boroughs (accessible by train from Manhattan). As a mostly commuter campus, CSI can be reached by public transportation or by car. Scenario 1: My Assignment Is Due and Something Is Wrong with the LMS! Let's put things into perspective through the eyes of Lynda, a 19-year-old female student who lives in Brooklyn, takes public transportation to attend classes at CSI, and then has the additional stress of working part-time. Lynda just completed an assignment and is getting ready to upload her paper to our learning management system (Blackboard). For some reason, she is not able to log in. What went wrong? Lynda is pretty good with technology; however, she wants to get some extra help from our IT staff since she is under the gun to submit the assignment. She is cutting it close as she needs to catch a bus to the ferry to get to her job on time. In the past, Lynda would have had to contact the help desk (located on the other side of campus) and wait for assistance. However, thanks to IOT technology, Lynda is able to check the status of CSI-supported systems using her mobile phone (see Figure 1). Figure 1: System status as seen on the web. She immediately sees that Blackboard is offline, and is able to confirm that e-mail is working correctly. She directly e-mails her instructor, informing her about her problem and stating that she will submit her assignment in the evening, after work. 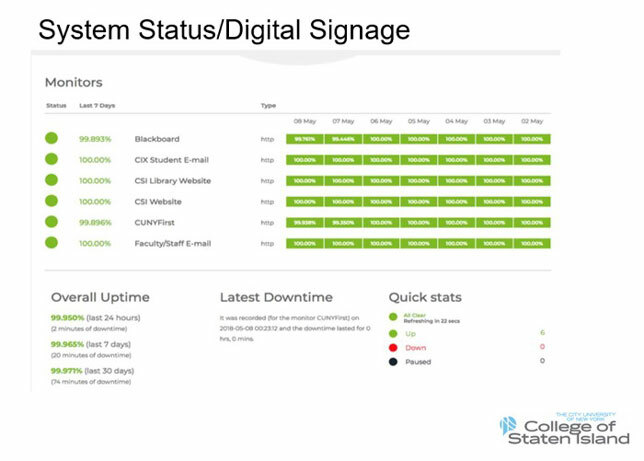 We've also made system status information available to students on a real-time display in the library, help desk area and the student center (see Figure 2). Implementing this system was fairly straightforward. 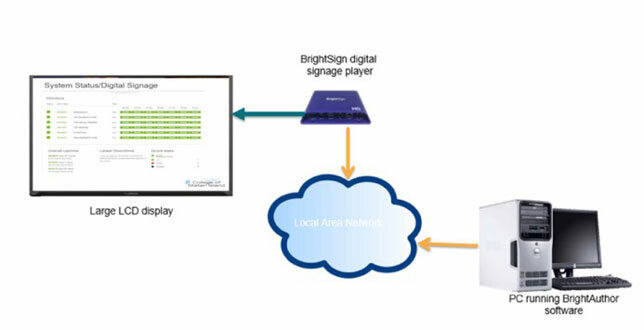 For the on-campus displays, we leveraged BrightSign digital signage players (very low-cost, about $250) to display content on LCD screens (see Figure 3). When displaying system availability on the web, however, we ran into one challenge: meeting ADA requirements. In order to address this, CSI's programming staff customized the API and developed a system status interface that met ADA Level AA requirements. Going forward, CSI is exploring a unified solution for system notifications and content in all areas. Currently, we have several LCD displays on campus leveraging BrightSign players as well as a large LED display using a Daktronics system at CSI's main entrance, which displays relevant campus information and news items. With a unified system, we will be able to display content as well as public safety messages when needed. Scenario 2: Where Can I Find an Available Computer? Let's meet Joe, a student who lives in the Bronx and commutes to CSI via public transportation — which takes over an hour each way. Joe also has a job in the evenings, which requires him to be very diligent with his schedule. It is crunch time for Joe, as midterms are approaching and he needs to submit his assignments. Because he does not have a computer at home, he needs to rely on the technology resources on campus. Luckily, CSI has four public labs on campus in addition to computers available on three floors of the library. In total, Joe has more than 250 computers to choose from in order to do his coursework. Wouldn't it be great if Joe knew in advance, which labs and library spaces had available computers not in use by others? Many of his courses are located on the North side of campus, but the public lab that is closest to his classes is always busy. Furthermore, since the campus center is so noisy, he is willing to walk across campus (remember 204 acres) to work in the much quieter library, if he can be assured that computers are available. The solution to Joe's challenge was using IoT technology to provide information on actual computer availability. Using LabStats software by Computer Solutions, we are able to show real-time computer availability in all CSI's public labs. Out of the box, LabStats worked fine; however, we needed to work with the vendor in order to make improvements. LabStats overlays colored icons on maps of the labs and library to graphically depict the status of machines in a given space. However, feedback from our test base showed that the initial icons were confusing, because students could not distinguish between computers that were turned off and those under maintenance. We worked with the vendor to change the icon colors on the maps for accuracy and clarity. 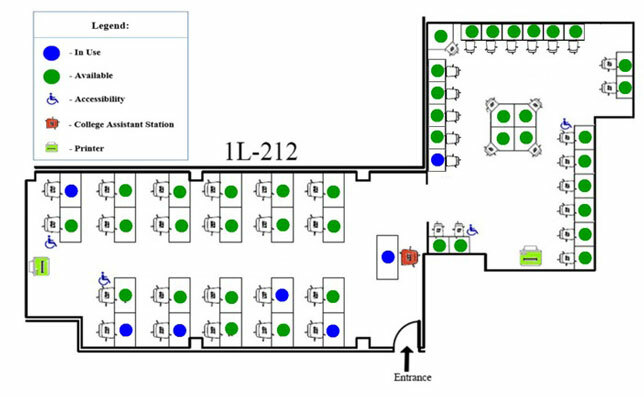 Also, the diagrams of the computer areas were not a ready-made solution; we worked with blueprints provided by our Campus Planning Office and modified them to create a schematic for each of the spaces. Students are now able to see which computers are available in a given time and location without having to physically go to the lab. 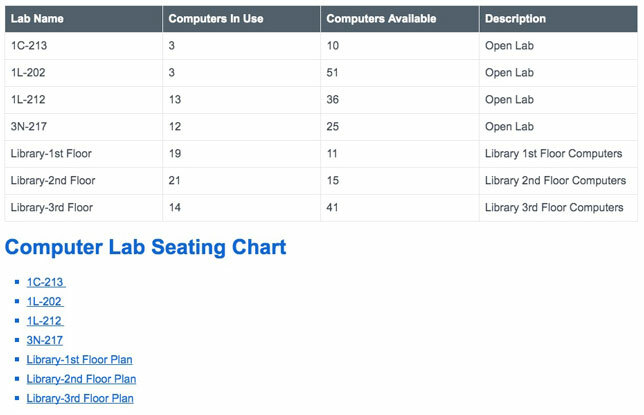 Through a web interface, student can view the information as a table, created by our programming team in order to accommodate ADA requirements, or click through links to maps for individual computer labs (see Figure 4). The information is also available on our digital signage displays. The maps provide a real-time diagram of available computers and where they are located (see Figure 5). Our simple IoT solution for computer availability addressed not only the challenges that students were experiencing, but also administrative challenges — specifically those related to allocating resources. For example, Information Technology is now able to monitor computer usage and use that data to develop accurate staffing for labs and schedules of operation. In addition, these usage reports can be used to analyze historical data and identify trends over time. Finally, the LabStats application can depict software usage, which provides additional information that can help determine whether to renew a software purchase. Scenario 3: Where Is the Bus? Lynda and Joe are both typical profiles of some of the students attending CSI. And their stories had one thing in common: Both students relied on public transportation to get to the main campus. Students traveling from Manhattan must take the Staten Island Ferry to the Island and then catch the CSI shuttle bus to the main campus. The CSI shuttle bus runs between the main campus and the St. George Ferry Terminal (see Figure 6) on a specific schedule, which can change based on several circumstances: time of day, day of the week and semester breaks. In addition, buses may be out of service due to repair. Since many of our students commute to campus using public transportation, relying on the shuttle bus becomes a necessity. 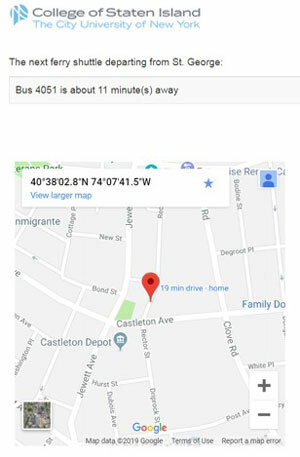 Although the bus schedule is available online, students often need to know the number of minutes for the bus to arrive either at the main campus or the ferry terminal. In order to address this challenge, we we placed a router/hotspot and Raspberry Pi 3 in each of the buses. Through GPS technology and an Openrouteservice API, we were able to leverage the devices to collect and send location data to a database hosted at CSI. Python scripting was used to build a matrix by computing the times of routes and distances that the busses were traveling. The end result: Bus arrival information is updated in real time on our bus tracking webpage (see Figure 7). After the page has loaded, users can choose which bus they are waiting for or download current schedules provided by CSI Operational Services. Similar to our other IoT solutions, our shuttle bus application also experienced some challenges. For starters, we did not know when buses were removed from service and replaced with buses that were not part of the CSI fleet. As a result, these buses did not contain the IoT technology and were not appearing in our database. In order to address this situation, we needed to order additional hotspots and Raspberry Pis for these buses. Unfortunately, the units we received did not have GPS capability, thereby delaying our "go live" date. After finally receiving the correct hotspots we were able to go live for the Spring semester. First on the agenda is to assess the success of our IoT solutions. We will be working with Student Government and Student Services to collect feedback on all three solutions, and will continue to make changes accordingly. In addition, we will look to expand the digital signage solution toward a more robust and unified whole campus solution. Finally, we are looking to expand the reporting capabilities of the computer availability software to provide usage data on a more granular level. In addition to bus tracking, we hope to expand our GPS application to leverage campus wayfinding solutions. Using beacon technology, we are looking to implement a solution to help students easily find campus resources such as library books, offices and general wayfinding around the campus. We are also excited about our Alexa pilot. Utilizing Amazon's Echo Dot smart speaker with Alexa, we hope to assist students, staff and faculty by providing on-the-spot answers to various questions relating to IT and the campus. For example, questions such as, "How do I change my password?" "Where is help desk located?" "How do I reset my printing quota?" and "What accessibility software is installed in the computer labs?" are just some of the thousands of questions that can be asked. This involves programming Alexa with myriad queries, in the different formats they can be asked, followed by their related answers. This will help students get answers to their questions quickly, while allowing help desk staff the time to address more time-consuming issues. In addition to Alexa, we plan to incorporate robotics technology within IT. For instance, with a telepresence device from Double Robotics, we will explore ways to have an IT "presence" without having to be physically present at a location. After authenticating into the Double Robotics website through a computer or other device, a user would then be able to control a robotic double, serving as its eyes, ears and voice. With controls from the keyboard, the user would direct its motion — where it goes and what direction. We hope to test the telepresence robot in various instances, such as speaking to students at orientation, doing surveys, attending meetings, allowing a professor to teach at the satellite St. George campus from the main campus or another location, allowing homebound students to attend class, or enabling a staff member to attend training seminars when unable to leave their office.